Itchy facial skin, also called pruritus, may cause irritation and tingling of the skin. Chronic skin itching may also cause your face to become inflamed, which can be embarrassing. Determining the underlying cause of itchy facial skin will assist in healing this skin issue. Topical treatments can also ease the discomfort. Itchy skin that is accompanied by a rash is usually caused by dry skin, according to MayoClinic.com. Weather changes, humidity changes and using air conditioning or heating systems can cause itchy facial skin. Bathing too frequently or using very hot water while bathing can also cause this skin issue. Nonprescription oral antihistamines and topical corticosteroid creams can be used to ease facial skin inflammation. Applying warm clothes to the face after applying corticosteroid creams can help the skin soak up the medicine. 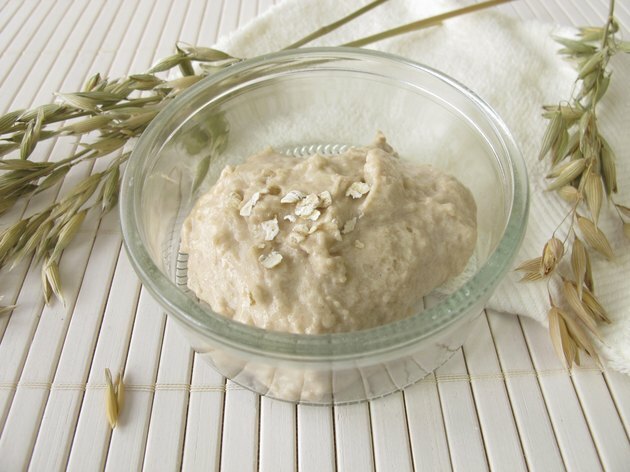 Taking a cool oatmeal bath can also assist in soothing itchy facial skin. Another option for itchy facial skin is light therapy. Your dermatologist will use ultraviolet light on the face to ease itchy skin. Some insurance companies don’t cover these procedures. Check out coverage ahead of time to determine affordability. Select facial products that don’t contain dyes or perfumes, recommends MayoClinic.com. After washing the skin with a gentle cleanser, apply a moisturizer that doesn’t contain fragrance. Getting rid of dryness can reduce inflammation in the skin. Wash towels and bedding with a mild, unscented detergent. Using an extra-rinse cycle when washing clothes may also help. Some people think that itching the skin doesn’t cause long-term harm. Constant itching, however, can increase inflammation and risk for scarring. Prolonged itching may also cause neurodermatitis, according to MayoClinic.com. This is a condition that causes the skin’s texture to become leathery after frequent scratching. The skin is also at higher risk for bacteria infection if scratched often. Talk with your doctor about itchy facial skin. Although usually due to dryness, there may be an underlying cause for the itchiness. For example, skin conditions such as psoriasis or hives may cause facial skin issues. Internal diseases, such as iron deficiency anemia, thyroid problems and cancer can also cause itchy skin. Facial itching can also be a drug reaction to antibiotics, pain medications or antifungal drugs, according to MayoClinic.com. Your doctor can rule out underlying causes and assist in treating itchy facial skin.